Carlos Santana in a Marlins uniform? Surprising at it may seem, The Athletic’s Ken Rosenthal (subscription required) reports that Miami was in talks with the Mariners about the veteran first baseman before Seattle flipped Santana to the Indians as part of a three-team deal with the Rays. It’s been a quiet offseason for the Marlins as they continue their rebuild and weigh J.T. Realmuto trade offers, though since their past fire-sale moves have cleared a lot of future payroll space, there have been indications that the Fish could use this room to potentially to add future trade chips. The Marlins had interest in free agent D.J. LeMahieu, and Santana is owed $35MM over the next two seasons. Between the Marlins’ flexibility and Mariners GM Jerry Dipoto’s creativity in swinging deals, any number of scenarios could have been floated. The most obvious offer could have been a “buying a prospect” type of trade, where the Marlins absorb a big chunk of Santana’s salary if the Mariners added some minor leaguers along in the deal. If not a prospect, perhaps the M’s could have included a Major League player along with Santana in a package to Miami, potentially a needed reliever or a left-handed bat. Whatever was discussed, Seattle ended up preferring the return from the three-team deal (a Competitive Balance Round draft pick and $10MM in salary relief), though the Marlins are certainly emerging as a possible trade partner for teams trying to unload an ill-fitting contract. The Reds were willing to offer J.A. Happ a three-year contract and give him more in guaranteed money than the $34MM he received from the Yankees in a two-year deal (with a $17MM vesting option for 2021). New York’s offer, however, included a higher average annual value than Cincinnati’s offer. Rosenthal speculates that Happ could have based on his decision on a desire to return to a contender, or perhaps the fact that pitchers are generally wary of the hitter-friendly Great American Ballpark. The Happ situation could be a reason the Reds are looking to work out an extension with Sonny Gray before acquiring him from the Yankees, a tactic that Rosenthal says has surprised some rival agents and executives. While Gray’s success outside of Yankee Stadium has made him a popular bounce-back candidate on another team, Rosenthal wonders if the right-hander might want to lock in a multi-year payday now in the wake of his 2018 struggles. Gray might welcome a chance to avoid a free agent market that has become less friendly to veterans, and Cincinnati offers him a familiar face in pitching coach Derek Johnson (Gray’s former coach at Vanderbilt). Rosenthal’s piece also offers a broader overview of the Reds’ offseason, which has seen the club try to make significant upgrades even while still looking like postseason longshots in the competitive NL Central. Cincinnati has been willing to trade some second-tier prospects to add established Major League players, while resisting moving any of its top minor league talents (such as Nick Senzel or Taylor Trammell). The Astros and Mariners both had interest in left-hander Martin Perez before Perez agreed to join the Twins yesterday. Perez picked Minnesota since he wanted to be a starting pitcher next season, which likely gave the Twins the edge over the Mets, though the other suitors might have had more room in their rotation. The Astros are thin on pitching, though since Houston plans to contend next season, it might have been a taller order to assign a starting spot to a pitcher who struggled as Perez did in 2018. The Mariners have a full rotation plus Justus Sheffield waiting in the wings at Triple-A, though more room could have made for Perez — Felix Hernandez’s health and future as a starting pitcher is questionable, and Mike Leake has been the subject of trade rumors this winter. The Nationals have had a pair of “brief” meetings with Josh Harrison’s representatives at MSM Sports, tweets Jesse Dougherty of the Washington Post. While there’s mutual interest, Dougherty reports that Harrison’s camp is also looking “closely” at other landing spots as well. Whether that’s due to what the Nats would be willing to offer, how they’d plan to use Harrison or another factor remains to be seen. The Nats have some uncertainty at second base, where Wilmer Difo and Howie Kendrick (who missed most of 2018 due to a ruptured Achilles) currently sit atop the depth chart. Top prospect Carter Kieboom may not be far from the big leagues, but adding a stable short-term option still makes plenty of sense for Washington. The Nats have been connected to Harrison several times over the past couple of weeks, but the versatile 31-year-old surely has other teams interested in his services. He’s been tied to the Yankees and Reds at various points this winter. Craig Kimbrel’s lofty asking price — a reported six years and $100MM — and the lack of big-market clubs currently willing to spend on a late-inning reliever could present the right-hander with a difficult market this winter, Buster Olney of ESPN.com writes. Olney likens the situation to last year’s tepid market for J.D. Martinez — a similarly elite player for his position (designated hitter) who lingered on the open market until landing in Boston in late February — a match that long seemed inevitable. The Red Sox may be the best bet for Kimbrel, too, Olney opines, especially given the plethora of more affordable options for smaller and mid-market clubs to pursue even if they do want to bolster the back end of their bullpens. The Marlins are one of several teams that has reached out to free-agent right-hander Bud Norris, tweets Craig Mish of SiriusXM. Miami has thinned out its bullpen this offseason by trading Kyle Barraclough (to Washington), and there’s a definitive lack of experienced arms at the back end of the organization’s bullpen. At present, Drew Steckenrider is the presumptive favorite to close games for skipper Don Mattingly, although the right-hander struggled down the stretch in 2019. Even as the Marlins rebuild the organization, there’s still an obvious opportunity to add some low-cost bullpen options to help take the stress off younger arms and, potentially, to be traded for further minor league talent down the line. The 33-year-old Norris has a 3.91 ERA with 10.6 K/9, 3.6 BB/9 and 47 saves over the past two seasons — the most recent of which was spent with the Cardinals. The Angels’ best offer to J.A. Happ topped out at two years and a total of $28MM, reports Jeff Fletcher of the Orange County Register (via Twitter). That checks in $6MM shy of the two-year total that Happ received to return to the Yankees, so it’s hardly surprising that Happ opted for the familiarity of an organization he already knew and a greater guarantee. Both offers contained vesting options, Fletcher notes. With Happ, Patrick Corbin, Nathan Eovaldi, Charlie Morton and Lance Lynn all off the board, the Halos have begun to see some of their free-agent options dwindle. Dallas Keuchel and Yusei Kikuchi are the top two starters from MLBTR’s Top 50 free agent list remaining, though as can be seen in our Free Agent Tracker, there are plenty of available options beyond that pairing. And, of course, the trade market will offer various options for the Angels, whose rejuvenated farm system should appeal to many clubs with pitching to spare. Dec. 17: The Yankees have formally announced Happ’s two-year contract and a vesting option for the 2021 season. Dec. 12: The Yankees have reportedly agreed to a two-year, $34MM deal to bring free agent southpaw J.A. Happ back to the Bronx. The contract is pending a physical; Happ is represented by Rogers Sports Management. When completed, the contract is expected to include an option year valued at $17MM. It would vest if Happ reaches 165 innings and/or 27 starts in the 2020 campaign. Happ has been one of the offseason’s most sought-after arms, with as many as 10 teams said to have some level of interest in the 36-year-old. Happ was known to have been weighing several two-year offers and was reportedly willing to sign with the first team that gave him a third guaranteed year. It seems, though, that he’ll fall shy of that target — meaning he’ll also land short of the three-year, $48MM that MLBTR predicted. As we noted in that post, however, it was never fully clear whether Happ would be able to secure a promised salary through his age-38 campaign. At the end of the day, the Yankees will pay a bit of a premium on an annual basis and surrender some control over that third year (through the vesting clause) in order to secure the services of the southpaw. Happ was for some time seen as more of a depth piece, but he has rather quietly emerged as a steady force in recent seasons. Happ, you may recall, raised his profile greatly with a surprising late-2015 run with the Pirates. That landed him the three-year deal with the Blue Jays that he just completed. Since he last put pen to paper, Happ has pitched to a 3.44 ERA with 8.7 K/9 and 2.7 BB/9 over 518 frames. After his contract was shipped to the division-rival Yankees in the middle of the 2018 campaign, Happ obviously impressed his new employer. He turned in 63 2/3 innings of 2.69 ERA ball over 11 starts, though he was later knocked around in his lone postseason appearance. That shouldn’t (and obviously didn’t) give the Yanks pause, particularly since Happ had previously generally performed well in the playoffs. For the Yankees, Happ becomes the third lefty rotation piece added this winter, joining James Paxton and CC Sabathia. The club tried for a fourth, Patrick Corbin, but watched him head elsewhere after deciding not to extend to bigger dollars and years than the organization felt comfortable with. In this case, the willingness to stick to his guns worked to the benefit of GM Brian Cashman, who did not have to full guarantee a third season to land a pitcher he obviously felt comfortable with. The Athletic’s Ken Rosenthal (Twitter link) reported a deal was close, with Andy Martino of SNY.tv (Twitter link) reporting it was completed. Jon Heyman of Fancred (via Twitter) and MLB.com’s Mark Feinsand (in a tweet) had details on the deal structure, with Bob Nightengale of USA Today Sports (via Twitter) and Joel Sherman of the New York Post (Twitter links) covering the salary terms. Here’s more on some notable hurlers…. Yusei Kikuchi will meet with interested teams later this month in Los Angeles, Kikuchi’s agent Scott Boras told reporters (including Henry Schulman of the San Francisco Chronicle) today. The Japanese left-hander has received interest from several teams but it will still be a matter of weeks before he signs with a Major League team. Kikuchi’s 30-day posting window opened on December 4, so there isn’t any rush towards a deal. The Rangers have yet to check in on Derek Holland, according to MLB.com’s T.R. Sullivan (via Twitter). The club is known to be on the hunt for relatively inexpensive pitching, and the Rangers have at least internally discussed the possibility of trying to lure Holland for another stint in Texas. Sullivan notes, however, that Holland’s preference would be to remain with the Giants or stay in the National League. The Phillies aren’t willing to go beyond a two-year deal for J.A. Happ and expect the left-hander to sign with another team, The Athletic’s Matt Gelb tweets. 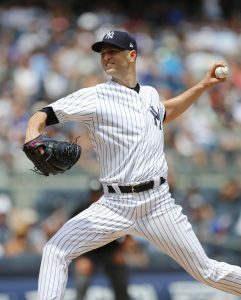 Several teams have offered Happ two-year contracts, though the latest reports have the veteran southpaw closing in on a three-year agreement to remain with the Yankees. Before the Mariners dealt Jean Segura to the Phillies for Carlos Santana and J.P. Crawford, Seattle also tried to obtain pitching prospect Spencer Howard in the trade, Jim Salisbury of NBC Sports Philadelphia reports. The 22-year-old Howard was a second-round pick for the Phillies in the 2017 draft, and he has posted big strikeout numbers over his first two professional seasons. Salibury figures other teams will also ask, or have already asked, about Howard’s availability, though the Phils surely aren’t too eager to part with such an intriguing young arm. There is a fair amount of other pitching depth in Philadelphia’s system, however, to potentially make Howard somewhat expendable at the right price. MLB.com ranks Howard a fairly modest 18th in their ranking of the top 30 Phillies prospects, with seven other pitchers ahead of Howard on the list. 7:41pm: Both Happ and former teammate Lance Lynn are “engaged with” the Astros, Yankees, Reds, Rangers and Blue Jays, Mark Feinsand of MLB.com tweets. Happ’s also continuing to draw the attention of the Phillies, while Lynn has received interest from the White Sox, according to Feinsand. 9:53am: It has seemed for the past few days that veteran lefty J.A. Happ could be the next domino to fall in the starting pitching market, and there are signs this morning that talks are advancing. Bob Nightengale of USA Today tweets that Happ’s market is “heating up,” while Jeff Passan of Yahoo Sports reports on Twitter that Happ is sitting on multiple two-year offers. The key question remains whether Happ will secure a guaranteed third season. Passan says that he has yet to receive such an offer. Happ’s representatives have “indicated he’ll sign with the first” team that meets that asking price, however, so it seems possible that something could come together swiftly. Entering the offseason, MLBTR predicted that Happ would indeed secure that third season in a new deal, riding his solid recent track record to a $48MM guarantee. There certainly seems to be sufficient interest to support such an outcome, though organizations are understandably hesitant to commit to Happ through his age-38 campaign. To this point, the Phillies, Braves, Yankees, Brewers, Reds, Angels, Astros, Twins, Blue Jays, and White Sox have all been connected to Happ. It’s certainly not impossible to imagine a few other organizations with possible interest as well, though at present it’s tough to gauge the likeliest landing spots. The Mets had a meeting with Wilson Ramos and his camp today, the New York Post’s Mike Puma reports (via Twitter). While the Mets are known to be exploring the catching market, some reports characterized Ramos as something of a secondary target for New York due to concerns about his lengthy injury history and his defense. Still, it can’t hurt for the club to touch base with Ramos to see if there’s a fit, especially since talks between the Mets and Martin Maldonado (reportedly atop the team’s list) had yet to develop as of last week. Like pretty much every Phillie not named Aaron Nola or Rhys Hoskins, Cesar Hernandez has been mentioned as a potential trade chip this offseason. The Phillies, however, aren’t looking to deal Hernandez since they feel the second baseman will rebound in 2019 with better health, MLB.com’s Todd Zolecki reports (Twitter link). Hernandez spent much of the second half playing through a broken foot, which certainly contributed to his drop in production after posting above-average numbers in 2016-17. With Hernandez seemingly remaining at the keystone, Scott Kingery will remain as a super-utility player. The Phillies have kept up an “ongoing dialogue” with free agent southpaw J.A. Happ “over the last several days,” The Athletic’s Jayson Stark tweets. Philadelphia isn’t the only NL East team in on the veteran lefty, as Fancred Sports’ Jon Heyman describes the Braves as an “under the radar” contender for Happ’s services. Atlanta still seems to be in the running as Happ’s market is beginning to narrow. Braves GM Alex Anthopoulos has already acquired Happ once before, trading for the pitcher in 2012 when Anthopoulos was the Blue Jays’ general manager. Some teams have the impression that the Braves would be open to trading Mike Foltynewicz and Ender Inciarte, though Foltynewicz isn’t available, MLB.com’s Mark Bowman reports (Twitter links). While Atlanta has enough young pitching that a Foltynewicz deal is palatable on paper, moving a controllable young arm coming off a breakout season is highly unlikely. The team wouldn’t make such a move unless it received a ton in return, or unless the Braves had confidence that they would acquire another frontline pitcher in a separate trade. Moving Inciarte is perhaps more feasible, as Ronald Acuna could take over in center field. Speaking to reporters (including Gabe Burns of the Atlanta Journal-Constitution) today, Anthopoulos indicated that he hadn’t closed the door on deals involving players on the Braves’ 25-man roster. In a mailbag piece from Burns, he notes that Carlos Gonzalez has interest in joining the Braves, “though that may not be mutual at this time.” Atlanta has an outfield vacancy due to Nick Markakis hitting free agency, though Gonzalez might not be one of the top choices on the Braves’ board, if he’s under consideration at all. Gonzalez rebounded from a very poor 2017 season, though his 2018 numbers at the plate (96 wRC+, 99 OPS+) were still below-average. There haven’t yet been any talks between Don Mattingly and the Marlins about a contract extension, the manager tells MLB.com’s Joe Frisaro. Mattingly is entering the final year of his current deal, and indicated that he is more focused on the upcoming season than his future status. “I like it here. I want to be a part of what we’re doing and building it,” Mattingly said. “But, again, I’m just kind of at a point where I’m pretty comfortable with myself, where I’m at.” Mattingly, of course, was hired when Jeffrey Loria owned the Marlins, rather than the current Bruce Sherman/Derek Jeter regime, though the veteran skipper wasn’t one of the many in-house names replaced during the new ownership group’s wide-ranging overhaul of the franchise, both on and off the field. After losing out on Patrick Corbin and Nathan Eovaldi in free agency, the Yankees are reportedly considering re-signing left-hander J.A. Happ. However, there’s “industry buzz” that the team wants Happ back on a two-year deal, while he’s seeking a three-year pact, King reports. Despite Happ’s age (36), MLBTR does predict he’ll receive a three-year contract, considering he has offered terrific production dating back to 2015. As for the Yankees, cautiousness has been a theme for them this winter when it comes to free-agent starters. They fell a year and $40MM short of the Nationals’ six-year, $140MM winning bid for Corbin, were reportedly “hesitant” to give Eovaldi four years (which he got from the Red Sox) and now seem leery of overcommitting to Happ. Lefty reliever Zach Britton, like Happ, joined the Yankees in a midsummer trade. It now appears Britton’s Yankees tenure will go down as a fleeting one, as he’s a near-lock to leave for a team that would use him as a closer, according to King. The Yankees, of course, already have an established ninth-inning option in Aroldis Chapman. The 30-year-old Britton is also accustomed to closing, having racked up 139 saves with the Orioles from 2014-18. Britton was an elite closer at times during that span, which will help his cause on the open market. While the Yankees’ bullpen could lose Britton, it may welcome back free-agent righty Adam Warren. It’s not “out of the question” that the Yankees could bring back the 31-year-old, King writes. Warren has already been a Yankee twice, and both tenures ended with trades (he went to the Cubs for Starlin Castro in 2015, back to the Yankees when they dealt Chapman to Chicago in 2016, then to the Mariners in a surprise move last summer). Despite the Yankees’ proclivity for giving up Warren, he has mostly been effective since debuting in 2012. Between New York and Seattle last season, Warren pitched to a 3.19 ERA (albeit with a less encouraging 3.94 FIP) and posted 9.06 K/9 against 3.48 BB/9 in 51 2/3 innings. 9:12pm: The Yankees are “hesitant” to pursue a reunion with Eovaldi if his market pushes to four years, reports Joel Sherman of the New York Post. 7:55pm: Neither the Yankees nor the Phillies were willing to go to a sixth year for lefty Patrick Corbin, per reports from Billy Witz of the New York Times and Jon Heyman of Fancred (Twitter links), and they’re now left to seek out alternatives following Corbin’s reported six-year, $140MM agreement with the Nationals. For the Yankees, that means shifting their focus to a pair of familiar faces in Nathan Eovaldi and J.A. Happ, Jon Morosi of MLB.com tweets. Witz suggests that the Yankees will also continue looking into Keuchel and further explore the trade market. Meanwhile, it seems that the Phillies will be giving the Yankees some competition in some of those efforts. MLB.com’s Todd Zolecki reports that Happ will now become a primary focus for the Phils, while Fancred’s Jon Heyman tweets that Philadelphia “will consider” Dallas Keuchel. The Phillies are aiming to add one starter to the rotation, Heyman continues, with a left-hander in particular being a preference. Keuchel, Eovaldi and Happ are the consensus top starters remaining on the market, with the possible exception of Japanese southpaw Yusei Kikuchi, who was posted by the Seibu Lions of Nippon Professional Baseball yesterday. Of the bunch, Keuchel is subject to draft-pick compensation for a new team after rejecting a one-year, $17.9MM qualifying offer from the Astros. Both Happ and Eovaldi would’ve been candidates for qualifying offers had they not been traded midseason, thus rendering them ineligible to receive one. Soon to turn 31, Keuchel has been a workhorse in the Houston rotation over the past five seasons, pitching to a collective 3.28 ERA with 7.4 K/9, 2.4 BB/9, 0.8 HR/9 and a whopping 60 percent ground-ball rate that leads all qualified Major League starting pitchers in that time. Keuchel, a two-time All-Star and four-time Gold Glove winner, hasn’t been as dominant since winning the 2015 AL Cy Young Award, but he led the AL in starts last season and has turned in a sub-4.00 ERA in four of the past five seasons. Eovaldi, 29 in February, returned from Tommy John surgery with a flourish in 2018, raising his free-agent stock more than perhaps any starting pitcher other than the aforementioned Corbin. He’s been most prominently connected to his hometown Astros and the Red Sox as of late — neither of whom figure to be thrilled with the concept of the Yankees making an increased push to sign the flamethrowing righty. Happ, 36, is reported to have received interest from as many as 10 teams. Because his age suppresses the length of the contract he can reasonably be expected to land, Happ has drawn interest from clubs in all market sizes. The Brewers, Reds, Twins, Angels, Astros, Blue Jays and White Sox are among the clubs that have already been linked to Happ, to say nothing of previous connections to the Phils and Yanks — both of which now figure to increase with Corbin off the board.